PG Tips was launched in 1935 by Brooke Bond. The next 30 years, especially the war years, were peak times for tea drinking and the brand thrived in its place at the heart of British life. 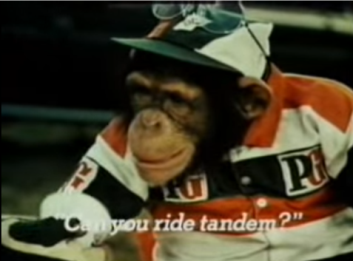 The 1950s brought commercial TV and the start of the much-loved chimp ads, which were to continue for 40 years. The campaign was such a hit in its early days because it was unique in its use of “apparently talking animals”, actually though a voiceover by Bob Monkhouse, as well as Peter Sellers and Cilla Black, a technique much copied since. The second commercial ever aired by ITV was “chimps tea party” for PG Tips. This was in black & white and was aired for 2 years. By 1958 PG Tips had risen from fourth to first place in the British tea market. In 1971 the campaign changed significantly. A writer called Tony Toller came up with the idea of making the chimps lip sync to a script rather than a voice over to chimp antics. And the most famous series of commercials was born. 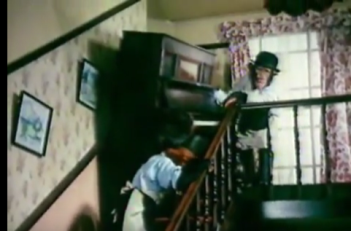 The most screened commercial ever is entitled Mr Shifter– spawning such classic lines as 'Dad, do you know the piano's on my foot? '- 'You hum it, son, I'll play it'. Another in this series was Tour de France when the hero (the same chimp in all the first series) called Chummy played Cyril the cyclist and the PG Tips chimps spawned a spin-off in memorabilia, including trading cards, egg cups and figurines. I had the privilege of launching PG Tips Tea Bags into a market then dominated by packet tea, in 1973 with the famous commercial entitled Morning Tea – the name of a yacht – a spoof on Edward Heath’s Morning Cloud. So what was the attraction of the chimp commercials and how were they made? Each 30 second commercial took 2 days to film using 4 cameras (very unusual for the day) all using different speeds. The chimps were encouraged to open and close their mouths and the art in getting the lip sync lay in the post production where bits of film were cut together from all 4 cameras to make the finished commercial. If you have ever studied the commercials or see them on YouTube look in the background for bits of fun. Names of characters, graffiti on walls, name plates, posters all were specially done to add to the humour. Oh and the set for each commercial scene was built 2/3 normal size so that the chimps appeared more human. Although it attracted some critics, particularly as the animal rights movement gathered pace in the latter part of the 20th century, the campaign was always popular with viewers. Although it attracted some critics, the campaign was always popular with viewers. But as the country became more PC and leaks occurred from the set on how the chimps had been encouraged by their trainers to talk, the commercial production had to move away from its base in Pinewood. The advertisements were stopped in the 1990s after complaints by animal rights organisations. But sales dropped and the chimps were bought back 18 months later using Californian chimps. The last 'Tipps family' advert was broadcast in 2002. But that was not quite the end of the story as the commercials were voted by the public as the UK's favourite advertising characters in 2003. So back to chimps – not real ones but puppets and up go sales! Tea might not hold the unassailable role in British life it retained in the middle of the 20th century, but PG Tips remains a key British brand, even without those funny old real chimps.